Where? Vizag! When? I visited Vizag in Andhra Pradesh for five days in the third week of April. Till date, it has been one beautiful trip of this year. In this post, I am only going to talk about my stay at ‘The Park’ at Beach Rd, Lawsons Bay Colony. But before I go in the details of my experience, let me share a small and lovely piece from a 2 page (in-house) newspaper ‘Park Living’, that I found around the reception area. I loved it so much that I carried it back the newspaper to my room later. The article not only details all good things about South Indian hausfrau’s hair accessory but it also inspires us to look into things more deeply and passionately. In simple words, it tells us that anything that is easily available should not be mistaken as ‘Ordinary’. As a traveler, it educated me to have a wider perspective. Found in every flower market and every late night traffic stop in India. It is also found infused in tea, rice and perfume. Everyday use : Makes for the hair accessory in South India. The temple deity’s ceremonial regalia and wedding pandal’s obligatory decor. Purity and sensuality is the USP of this fragile bloom. Bollywood Role: Well, in the olden days it was often seen wrapped around a lover’s wrist. The heady scent denotes ardor and decadence. Why was I so keen to stay at PARK? 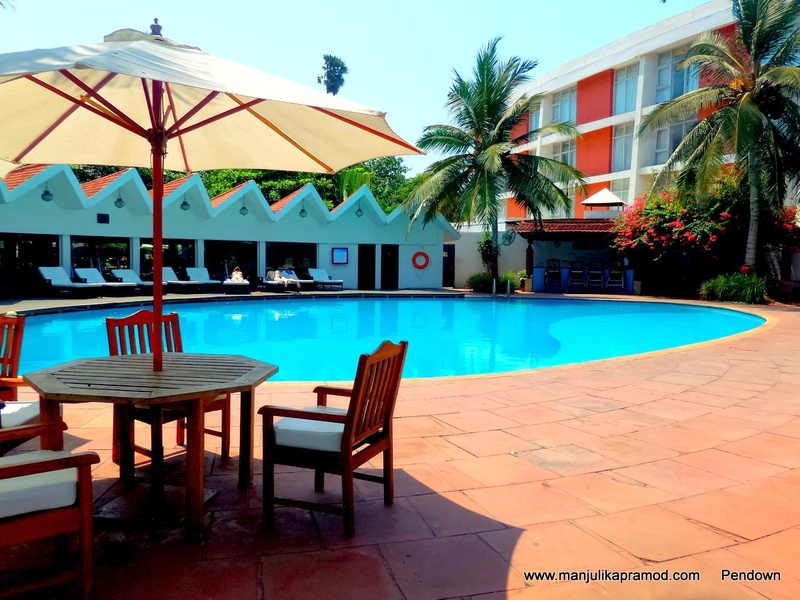 When I googled about the places to stay in Vizag, one name that popped up again and again was ‘The Park’. Everyone who had lived in this beautiful property had sweet memories of it. In fact its in-house restaurants stood quite popular among the locals too. 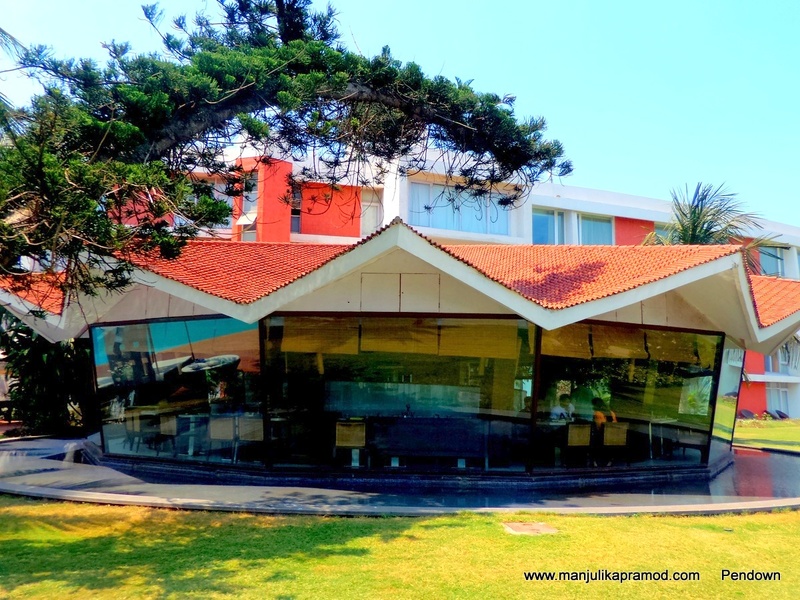 As travelers who were visiting Vizag for the first time, both me and my husband were impressed with the location of the hotel. It was in the heart of the city overlooking the Bay of Bengal. The idea of a private beachfront, beautifully poised garden and the orange sunsets in a tropical setting promised a beautiful vacation to us. I checked in at 10 in the morning. After the hassle-free check-in formalities, I was directed to my room on the ground floor. Soon I entered into a well maintained, brightly-lit, stylish and spacious room. After arranging my luggage in the cupboard, the first thing I did was I checked the mid-sized washroom. To my happiness, it was neat and tidy. I missed a fancy towel art on the bed but otherwise the bed-sheet was white and crisp, the way I prefer. My husband was tempted to take a nap before heading out to see the city. But not me. The moment I was comfortably settled in the room, I was all set to head out and find the chess board (I had seen a lot of pictures of it). When I was just stepping out of the door that I had entered from, I noticed an additional door behind the curtains. It was just opposite to the side from where I had entered. I opened it in curiosity and absolutely fell in love with what I saw later. My room led me into a beautiful setting, closer to the sea. 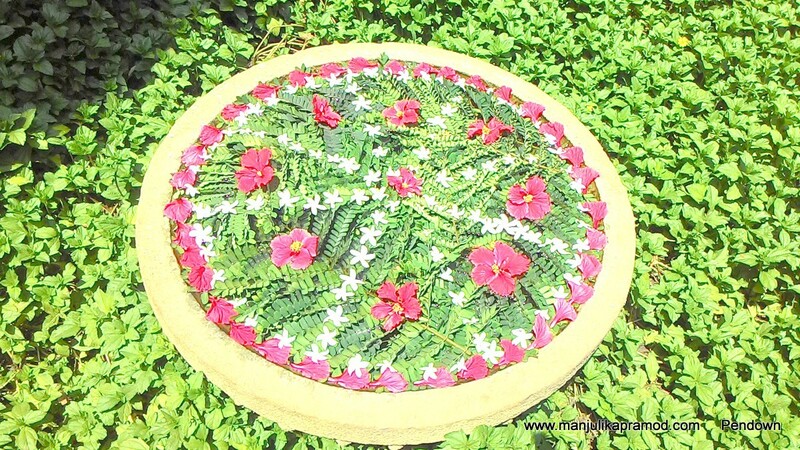 The door opened into a sprawling garden with attractive table settings. The nearby board clearly stated that this area was exclusively meant for the guests living in the rooms. Without any hesitation, I simply closed the door behind me and started making my way through the garden. As far as my eyes could see, I could only see greenery followed by the blue. On my right, the guests were enjoying a dip in the pool. The poolside restaurant ‘Aqua’ looked welcoming but it was only open in the evening. I could see a lot of human activity on the right. There was a reading lounge and a restaurant area first and then a swimming pool, gym and a spa area which I decided to explored later. 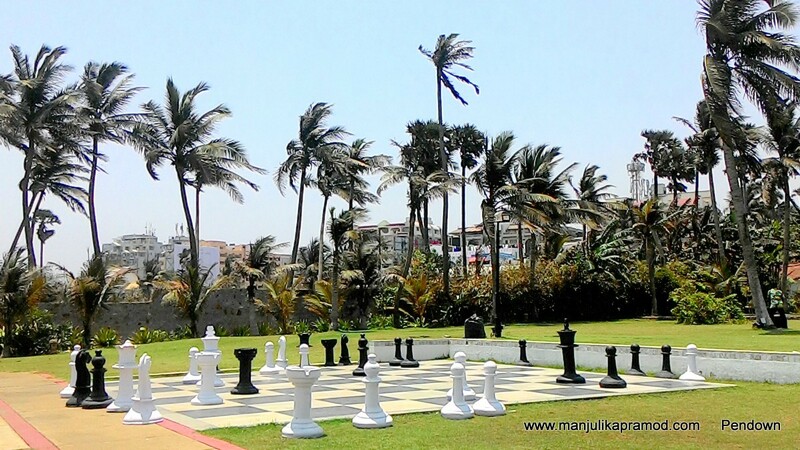 For now, I was excited at the sight of the chessboard, right there at the beachfront. It was big indeed! When I saw it closely, I was taken in for a nostalgic delight as chess had always been my favorite indoor game after scrabble. I wanted to play but there was no body to play as my opponent. It seemed as if the people who had played before me had left their game mid-way and left in haste. While I picked the chess pieces, the palm trees waved at me and the breeze drifted over the waters of the bay. I loved the ambiance. If I had had no pre-plans, I would have settled just right there. In Delhi, we are so deprived of these coastal landscapes, that I can sit on an empty beach all day and hear the waves splash, make their own sweet conversations. I walked till the end of the path above. There was a fence that kept me away from the sea but there was way to go till the rocks. While I looked around here and there, the breeze caressed my cheeks and hair, engulfing me in the beauty of the location. As I further explored, I learnt that the restaurants, Bamboo Bay and Shack were on my left. Designed by renowned landscape architect and interior designer Michael Richard White, Bamboo Bay was all about ethnic heritage of East Indian tribal culture. As I tried to peep in, I was informed that it opened every day from 19:00 to 23:00 hrs. 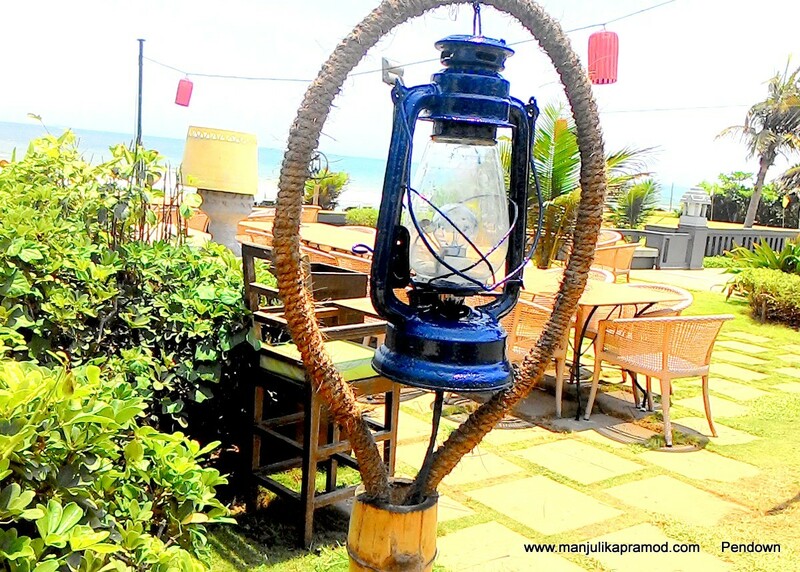 For those who loved outdoor setting of a shack and had a knack for Moroccan, Seafood, Mediterranean, Grill, Shack was the place named as per its ambiance. It also opened from 19:00 to 23:00 hrs. The evening looked exciting here. When I turned my back to the sea, I could see there was lot many sections of the hotel that I yet had to discover. Vista Restaurant caught my attention for its shape and its glass walls. It opens everyday for lavish buffet breakfast and dinner spread. There is Ala Carte for lunch. It also has a 24 hrs coffee shop. Just next to it, I could see the beautiful swimming pool and the open dining restaurant AQUA just next to it. I was tempted to jump in the pool right away but as my other plans would have it, I was supposed to get ready and head out to attend the rituals that take place before a wedding. In the evening, I was looking forward to my best friend’ wedding. 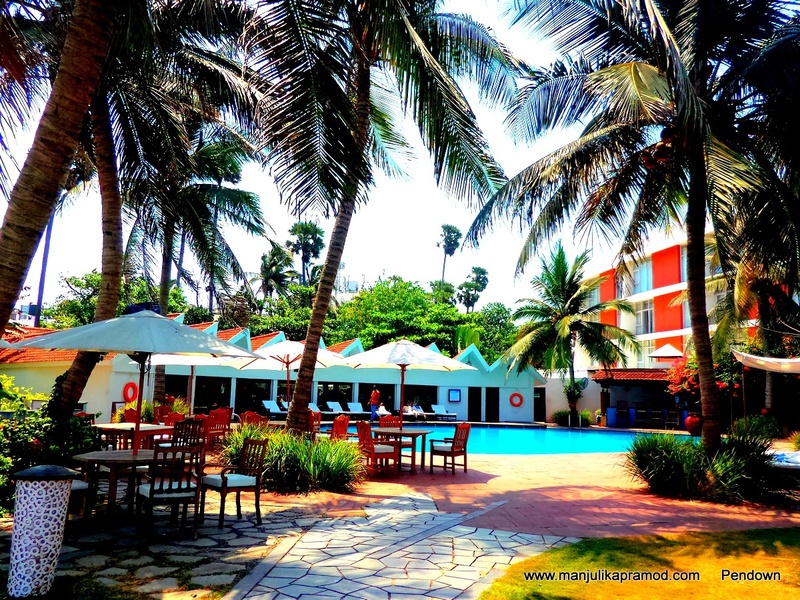 Here, I must add Vizag makes a wonderful place for destination wedding. Ever since I have returned from my friend’s wedding, I have been suggesting this to everyone. This place offers international menu and barbeque delicacies. There is a fantastic list of cocktails, classic and contemporary world wines. The candlelit tables . The place is famous among the locals as well as the guests for unlimited entertainment from daily screenings of live sport events to trendy shows, Regular events & exotic shows. The signature dish is ‘ Thin Crust Napoli Pizza topped with Smoked Chicken‘, tomato and Red Onions. On the first day, I did not return to the hotel to enjoy the sundown. My friends wedding was taking place in another hotel and I had returned to Park only to dress up. We only returned next day after the sunrise. I slept for few hours before waking up all hungry and exhausted. After an eventful night, I really needed to catch up on some energizing breakfast. The day looked peaceful because I had no plans at all. There was no agenda for the day till my flight at 6 in the evening. 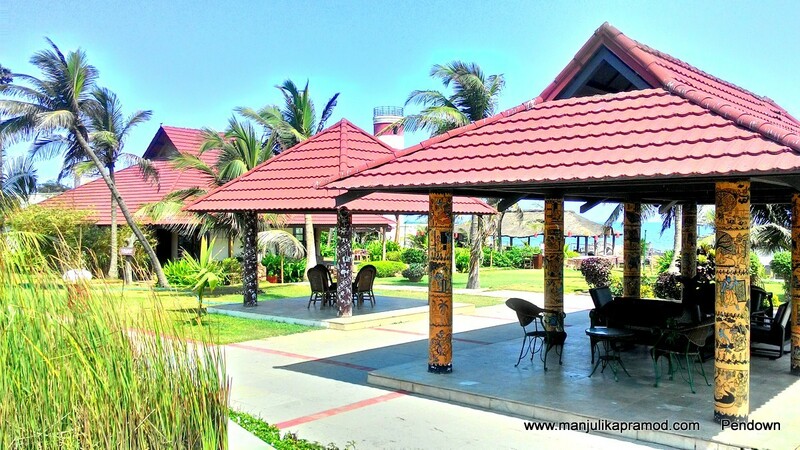 It was going to be a restful day in the hotel and this was one place where one could just be close to sea and indulge in the beauty of the place. Since the weather was hot and humid, I wanted to sit indoor, enjoy the food, read in the lounge, maybe go for a spa and explore other amenities. Thankfully, I decided to do it just the way my heart desired. When we walked in, this place was buzzing in energy. The breakfast buffet was laid in the center and it looked quite tempting. As I went around, I realized they were everything that you wanted. 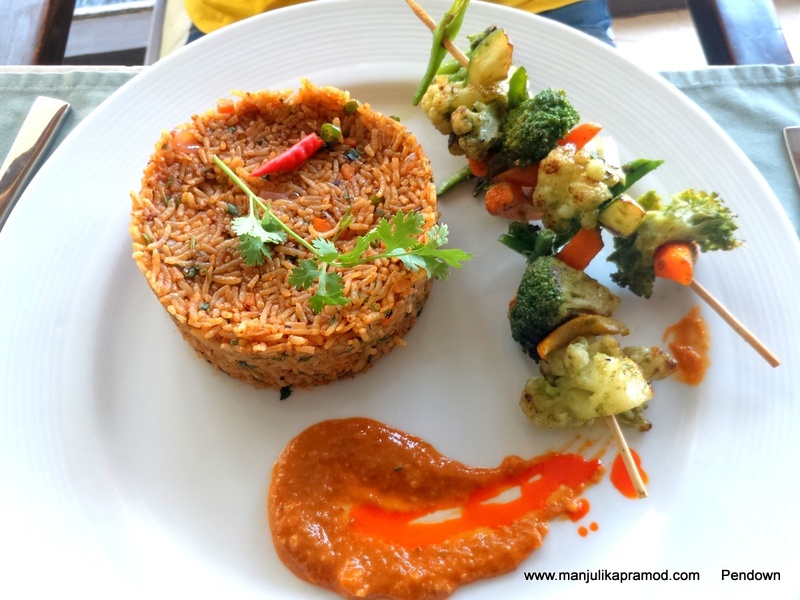 From south Indian delights to north Indian morning delicacies, from oriental to world cuisine, from buttermilk to fresh juices, this place impressed me. I filled my plate with my choices and returned to my table. Strategically made the glass walls gave an amazing view of the garden and the sea. The food was great and of course I loved the freshly made idlis. I remember, we ate for long and enjoyed it thoroughly. Interesting Bread Art! I am scared of reptiles and thus I was frightened for a moment. 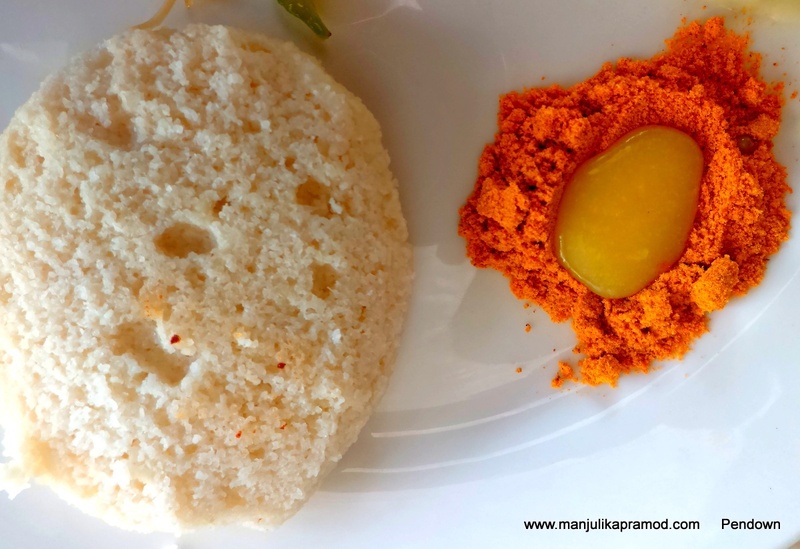 Idli with spicy powder accompaniment, MolagaiPodi. After a hearty breakfast, I decided to walk around with my husband. I filled him with all the details that I had discovered a day before. But there were a few things that were unknown to me as well. When I walked in this reading lounge, I was taken in for a beautiful surprise. 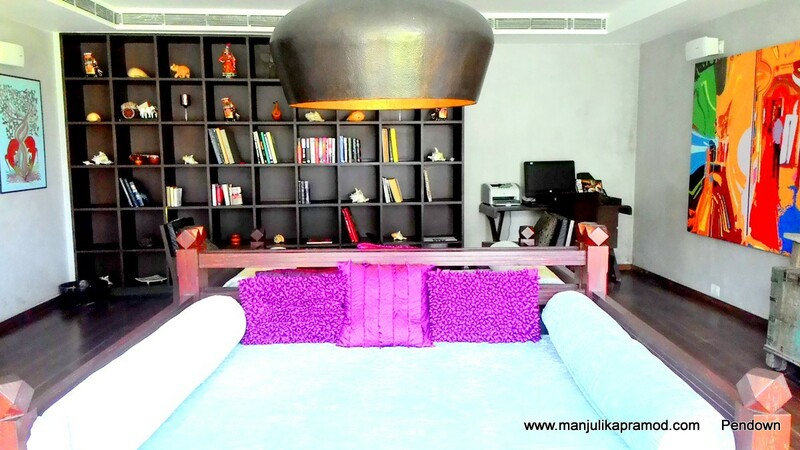 This place was done in special colors, modern art and special interiors. As far as the shelf is considered, I was really impressed with the collection. From miniature musical instruments to puppets, everything seemed to be delicately chosen. Some day I would like to have a similar reading room in my house and I would decorate it quite similarly. Once again, I went around in the gardens and sat under one of the shady seating arrangement. 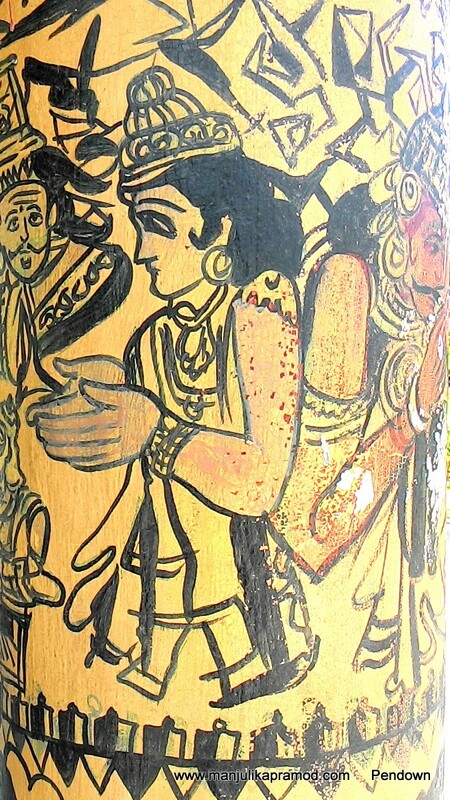 While I looked around, my eyes fell on the pillars and I noticed they were not painted ordinarily but had Ramayana story painted on them. Each one followed one another and there was a sequence. Later, I learnt that it was gradually becoming dull and soon it would be refurbished again. 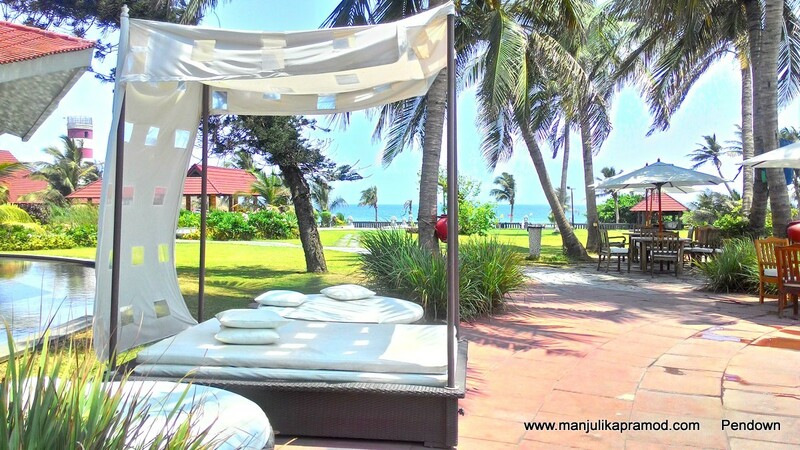 After this my husband chose to take a dip in the pool and I chose to lay down in one of these sun-bed by the pool. I had a delighting view to myself. Since we had a heavy breakfast, we went ahead with a light meal. It was a ‘Veg Nasi Goreng’ that we ordered for lunch at around 3 p.m. before packing my packs and leaving for the airport. When I ate the Nosi Goreng, I could easily say Vista serves great food. Though it was not having chicken or egg, yet it tasted as authentic as I had in Bali. The flavors of spice and the rice came out very well. Before leaving the hotel, I thanked the staff who had been very friendly and courteous in my two day stay. This property in Vizag definitely lives up to Park’s tagline- ‘Anything but Ordinary’. 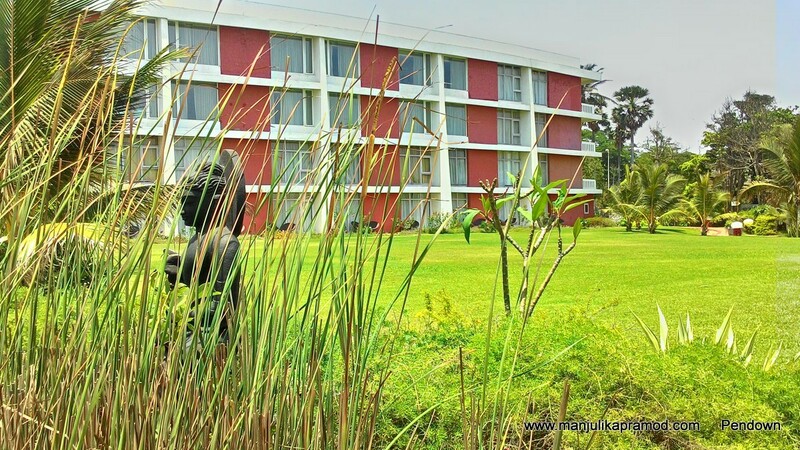 Its not about the lavishness of the rooms but about the hospitality, food and the proximity with nature. I have come back with fond memories of this place. And by the way, I really liked the idea of ‘Park Living’. No doubt, my stay was sponsored by the property but the views are all mine. 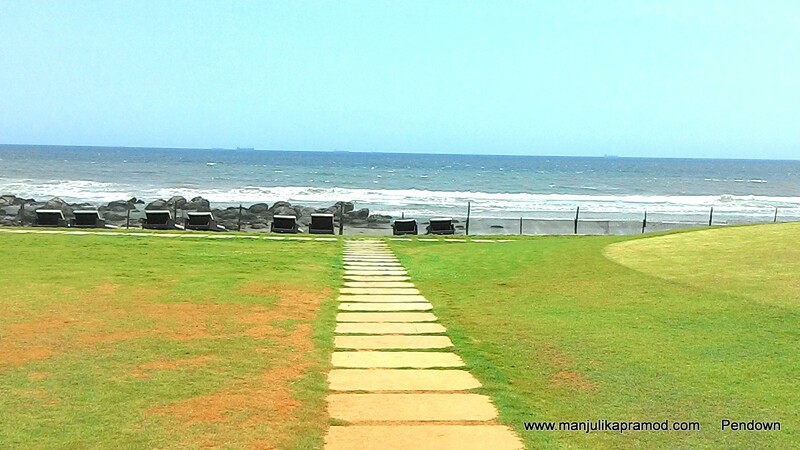 Whenever you visit Vizag, you can always pick this place as a dependable option. And if you have been here, do share your views in the comment.